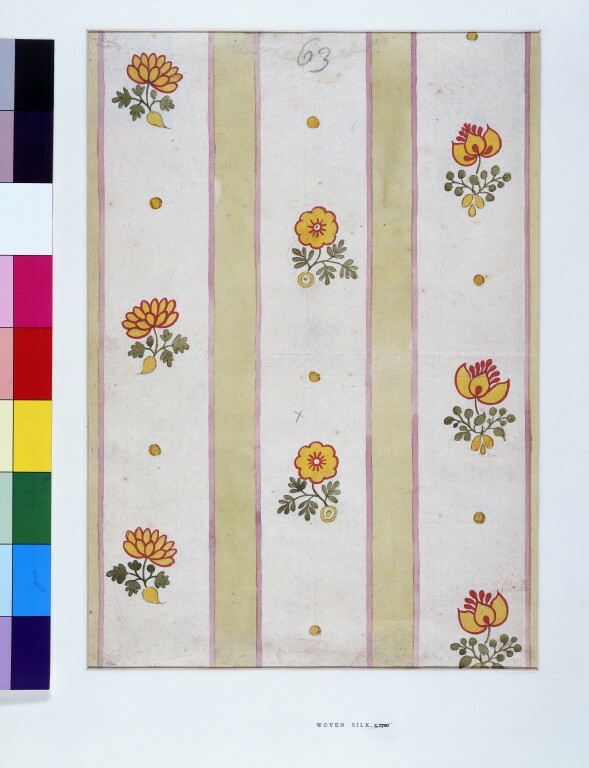 Design for woven silk from the 'Liddiard Set', in pencil, pen and ink and watercolour on laid paper, in yellow, pink, red and pale, mid and dark green, depicting stylised floral sprigs and decorative motifs. There are three types of floral sprigs which are evenly spaced in vertical panels with yellow spots separating each sprig. Each panel is bordered on either side by a thin pink stripe with a pale green stripe in the centre. This design contains similar motifs and colours to E.4480-1909. Portees [a collection of threads warped together] numbered 3, 1, 16, 1, 6, 1, 16. Handwritten text on the back of the design. Rothstein, Natalie. 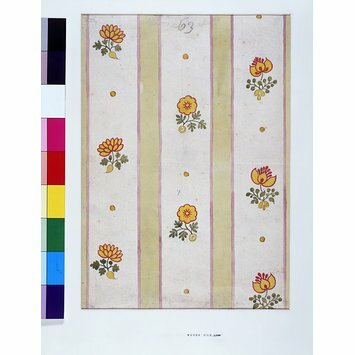 Silk Designs of the Eighteenth Century in the Collection of the Victoria and Albert Museum, London with a Complete Catalogue with 473 Illustrations, 371 in Colour. London: Thames and Hudson, 1990. 351p., ill. ISBN 0500235899.